When all the leftover Thanksgiving turkey, stuffing, and pumpkin pie are gone, I’m always in the mood to get back to the basics. The cold snap in Atlanta during Thanksgiving week got me to thinking about a big pot of chili. Several months ago, I posted a healthy but delicious turkey chili recipe but this week I was craving a hearty beef chili with some spice. Many chili recipes call for ground beef, but for this post I was shooting for more of a chunky version. I started with a three pound chuck roast, cutting it into 1/2 inch cubes. Chipotle and poblano peppers and Guinness Extra Stout Beer gave the chili the chunkiness and body that I was wanting. Of course, nothing suits a big bowl of chili like cornbread. When you grow up in the South cornbread becomes a part of your genetic makeup. Pure, unadulterated cornbread was a staple on our Southern table, but as I’ve gotten older, I enjoy experimenting with variations using different ingredients. I featured my most recent variation in the post for Sliders with Smoked Chicken and Cheddar Sun-Dried Tomato Cornbread. 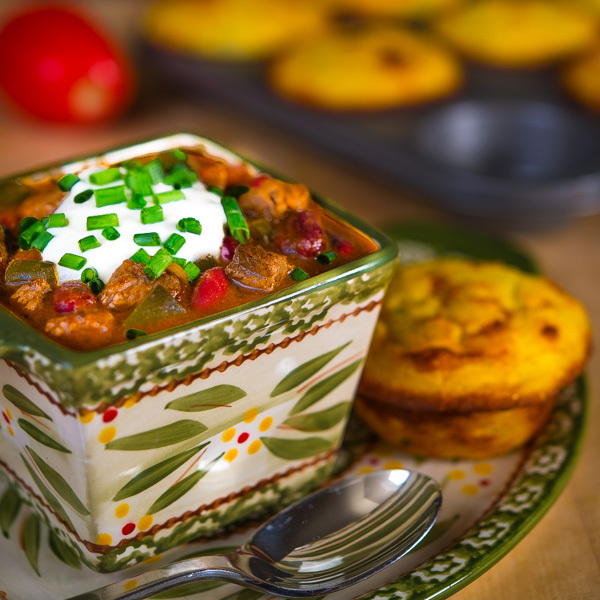 Serving this chili with my version of jalapeño cheddar corn muffins was a no-brainer and on a cold fall night, we had an awesome, back-to-basics, chili dinner. 2. Whisk corn meal, baking powder, and salt together in a large bowl. Add buttermilk and eggs and continue whisking until well combined. Add grated cheese, jalapeños, and butter and stir to combine. 3. Spray cups of muffin pan with cooking spray. Fill each cup with batter. Bake for 20 minutes. Turn oven to broil mode and cook for one to two minutes or until tops are browning. Watch carefully while broiling to avoid burning. 1. Heat two tablespoons olive oil in a large Dutch oven over high heat. Add beef in batches to brown, removing each batch from the pan before adding more . Add additional oil as needed. Set beef aside. 2. Add two tablespoons olive oil to Dutch oven and saute onion, poblano peppers, and garlic for three to four minutes until onions are translucent and slightly browning. 3. Add chili powder, cumin, and salt and continue cooking for one minute. Add beef, beef stock, beer, tomatoes, chipotle peppers, kidney beans, and tomato paste. Mix well and bring to boil. 4. Reduce heat, cover, and simmer for one hour or until beef is tender. Remove the top of the Dutch oven for the last 10 minutes. Ladle chili into serving bowls, garnish with sour cream and chives, and serve with jalapeno cheddar corn muffins. I love the jalapeno cheddar corn muffins.. I had it sometime back at some restaurant..It was delicious .. Thanks for the recipe 🙂 Beautiful clicks as always ! I appreciate the compliment, Sowmya! I’m not sure which I like better – the cornmeal muffins or the chili. Your pictures have me wanting to start licking the computer screen. But I do have a question – where’s the picture of the cornbread crumbled on top of the chili? 🙂 Just looking at that chili one can tell how rich in flavor it is with the Guinness and beef stock. Love it! Two great recipes here Bill. Thanks! I make chunky chili sometimes too. And I’m definitely in the mood for chili at the moment! I’m making some tomorrow, although likely with ground beef. I’ve used beer in chili before, but never Guinness – I should try that. And I love the Jalapeño Cheddar Corn Muffins! My kind of flavor. Good stuff – thanks. This was the first time I’ve added beer to chili and I really like the body it adds. Thanks for dropping by, John! I would like one large bowl of this please! I’ll pack up a bowl for you and send it right over! 🙂 Thanks for dropping by, Jocelyn! Always happy to add another awesome chili recipe to my dinner rotation — thanks for this! I appreciate your visit, Julianne! Happy holidays! Cold weather always seems to invoke a big pot of chili in my world too. This looks like an amazing pot of chili and with cornbread, it rocks. Thank you, Velva! I always appreciate your comments! Happy holidays! Beautiful photo. We like to change up our chili too. The hubs will love this one with the Guinness as he is a British beer lover. Thank you Christine! I appreciate the compliment! Glad to find your blog too! Thanks, Abbe! There’s plenty of room for him too. I need some regular taste testers!